Our affiliate program has been temporarily postponed and registration for the program is not available at this time. 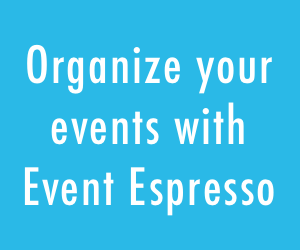 Get paid by helping other event managers understand the power of Event Espresso by becoming an affiliate. Go to the affiliate site to get your affiliate account and link. All affiliates get 20% from each sale (option to take a smaller % commission and offer a discount to your customers or website visitors via discount code, contact us for details). Payments are made only through paypal. Payments are sent at the beginning of the second month after the month of sale. E.g. Sales in January will be paid at the beginning of March. This provides enough time for customers use the 30 day refund period. Payments will be made regardless of the sales volume. There is no minimum limit. You can create your own banner or use the ones below. When signing up as an affiliate you must indicate at least one website where you are using the Event Espresso affiliate program. You can not receive affiliate commissions for yourself. We recommend your clients purchase Event Espresso directly (using your affiliate link) so they can have their own account to receive upgrades and support over time. You can not use the term “Event Espresso”, “EventEspresso”, “eventespresso” or like terms in any paid search engine marketing, or for terms that we rank on the first page of the search engine. We will not compete with ourselves. From time to time Event Espresso may elect to offer affiliates coupons to use when promoting our offers. You are only authorized to promote coupons which have been assigned specifically to you. Use of any coupon which you are not authorized to use in your promotions on web pages, newsletters or any other medium is grounds for immediate termination from the Event Espresso affiliate program. Commissions will not be paid to any affiliate member who practices nefarious business tactics such as sending unsolicited email (SPAM! ), false or misleading marketing copy. Our program is intended to support online bloggers, writers, authors, and online publishers with original content over all other e-commerce enterprises. Regrettably, for this reason commissions will not be paid to coupon code aggregators, or any affiliate who posts coupon codes without express, written permission from Event Espresso, LLC. Affiliate membership can be canceled at any time without prior notice or consent. We require the referral URL of the sale so we can verify that our affiliate program is being used properly. This means you can not use URL redirects that ultimately hide the referral URL. These terms can change at any time, for any reason, under any conditions, with or without notification, solely at the discretion of Event Espresso, LLC. Last Updated: October 16, 2013.